company in Dubai Al Yam international commercial brokers together with Dr. Aisha Al Sayyar. 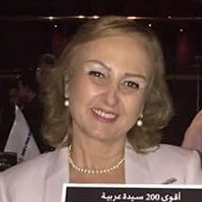 In February 2018, Yasmina was appointed as a Chairwoman for “Syria Saudi Company for Touristic Investments LTD,” the owner of Four Seasons Hotel in Syria. Through great will and driven entrepreneurial charisma, Yasmina made TCO a prosperous business, enjoying loyal clients and a favorable workplace for approximately 90 employees around Syria, a market traditionally dominated by men. Yasmina’s time was focused on Mira Trading that owns and operates malls and super markets in Syria till 2012. Following her family’s legacy in commerce, and charitable and community work, she founded Mawred, an NGO aimed at supporting female ventures; a committee to protect Slunfeh and Kassab forests; and was elected a president of Bashaer Al Nour, an NGO that cares for individuals with autism and Down syndrome. She also entered into an arrangement with Tishreen University to train fresh graduates. In 1999, Yasmina was nominated to be the Honorary Consul of the Netherlands at Lattakia & Tartous as well as a representative of the Dutch organization PUM, which promotes self-sustainability and private sector development. She was the first woman to be on the board of the Lattakia Chamber of Commerce and was elected three times as the Head of Lattakia Business Women’s Committee. .
Yasmina has been a board member and advisor for many organizations, was selected 3 times by Forbes as one of the 50 most powerful Arab Business Women and was chosen among the most 100 powerful women in the Arab World by the Arabian Business 3 times as well. Yasmina was decorated by H.M The Queen of The Netherlands as a “NIGHT”, and was elected as the best entrepreneur in Syria by E&Y in 2010. . In 2013 Yasmina was decorated by the Silver Dove international Award in Moscow. woman in Civil Society 2015. Due to the civil war in Syria, she left the country and came to UAE where she established Al Yam International Commercial Brokers 2014 and has a strong network of 34000 parties around the world following up opportunities thru her company in Dubai.